“They are fighting, fighting, every day,” he says. The two firms deadlocked over a cross-border rail contract are China Harbour Engineering Company and China Civil Engineering Construction Corporation. Their ugly saga has mushroomed from a spoiler bid, then a cancelled contract, into a lawsuit against the government. Issac’s puzzlement is shared at the highest levels. At an emergency cabinet meeting in July, Uganda’s President Yoweri Museveni expressed outrage at the confusion over the project. I used to report on corruption, but even I found the unruly competition between Chinese firms in Uganda eye-opening. It’s an awkward moment, and it’s difficult to explain their behaviour to Issac. I do my best: business is business, and they want profits. Things began normally enough when China Civil Engineering signed a framework agreement with the Ugandan transportation ministry in January 2012, after clinching a railway contract with a US$1.75 billion tender. But before work started another Chinese firm undercut it, at US$1.25 billion. In April 2013 the Ugandan government tore up the framework agreement and signed a new deal with rival China Harbour Engineering. In July 2014, China Civil Engineering took Uganda’s transportation minister to court, winning an initial victory and causing a minor crisis for the government. President Museveni expressed his displeasure in an emergency cabinet meeting on July 25. At least seven African countries are depending on the new rail link, so the family feud between Chinese firms was playing out in front of Uganda’s neighbours. Uganda will be the network hub of the East African Rail Network, which will link Uganda to Kenya, Tanzania, Rwanda, Burundi, Democratic Republic of Congo and South Sudan. The project forms part of the Chinese administration’s ambitious plans for investing in infrastructure construction in Africa. 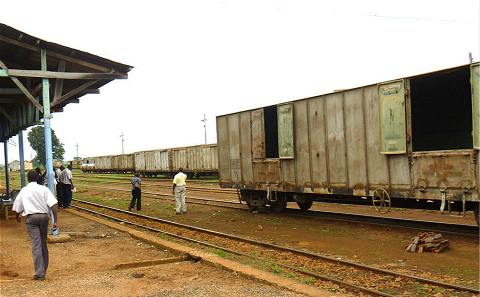 Uganda’s existing railways were designed in 1900: one-metre-wide narrow-gauge tracks, which can carry loads of no more than 15 tonnes at a maximum speed of 40 kilometres per hour. Years of neglect have reduced maximum speeds even further, to 15kph. The rail link will run from Mombasa through Nairobi and on into Uganda, where it will split into two lines; one running north into South Sudan, the other south from the Ugandan capital Kampala onto Rwanda, through Burundi, and finally onto Tanzania. The 2,700 kilometers of track are expected to cost US$25 billion. During his visit to Africa in May, Chinese premier Li Keqiang attended a signing ceremony for a Sino-Kenyan funding agreement for the railway’s Mombasa to Nairobi stretch. The project would, the Chinese media happily reported, bring Chinese funds, technology, standards, manufacturing and management experience to Africa. What the Chinese media did not mention was that prior to Li’s arrival two other Chinese state-owned companies, China Road and Bridge Corp. and China Railway Construction Corp., had been attacking each other in the local media on an almost daily basis. The East African railway scheme is just the tip of the iceberg. In 2010, China became the world’s biggest overseas contractor. In 2012, the value of overseas construction contracts undertaken by Chinese firms reached US$156.5 billion. But this also means that when competing for projects, particularly in developing nations, Chinese firms are facing other Chinese firms. Often, competitors are drawn from a small number of Chinese state enterprise giants. An air of scandal surrounds Chinese firms' projects. Uganda’s two best investigative magazines published major reports on Chinese companies in their August editions. Hydropower is another fraught area. In November, last year I visited a power plant being built in southern Zambia. A project manager from the China Power Construction Corp. told me that they had signed a deal with the Zambian government to restore the hydropower facility at Kafue Gorge. But a different Chinese firm then intervened and the government announced it would restart the tendering process—meaning all of his company’s work up to that date was wasted. Overdevelopment in China means dam builders are suffering from a lack of business. A vice-president with the Zambian subsidiary of Sinohydro Bureau 11 Co. told me that 50-60% of the company’s profits now come from overseas, and any problems in foreign markets could cause the firm to collapse. Equally important, Sinohydro and similar companies carry historical burdens: huge workforces that need to be paid. This means they need to get as many overseas contracts as possible. And although they are commercial enterprises, the State-owned Assets Supervision and Administration Commission sets annual targets, and company bosses need to win work if they are to look good. In theory the commercial affairs office at the local Chinese embassy is responsible for coordinating the interests of Chinese firms. But it may not be able to do so, or may not wish to do so; in Africa, it often does not undertake this role. The China International Contractors’ Association, a body with close links to the Ministry of Commerce, in theory has regulatory powers. But I have learned that though troubled by unruly competition among its members, it is powerless to act. In China’s political hierarchy, it is a bureau-level organisation. Its members, such as the Three Gorges Group, are of vice-ministerial level. Within the government bureaucracy such rankings matter, so the Association is only a minor player. Uganda’s potential for hydropower development (located in Africa’s Great Lakes region, and the source of the Nile) has made it a new battlefield for Chinese firms. But bitter competition and mutual vilification have left company insiders feeling that the present set up is unsustainable. “They’ve even asked me if I can get several hydropower firms together and sit them down and explain that things can’t go on like this,” complained one Chinese journalist in Uganda, who did not wish to name those involved. Hu Jianlong is a reporter at Southern Weekend. China is enabling developing countries to mirror its strategy of infrastructure-led development by providing the needed investment at low cost. The West has a lot to learn.